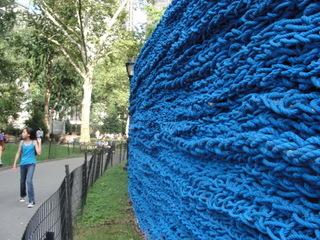 Art in Madison Square Park, New York, NY. Always good art in Madison Square Park. I'm a deadline-driven, highly collaborative and resourceful writer, editor, and content strategist who produces high-quality content for print and digital outlets. I have significant experience working in healthcare, finance, and higher education, and I have a wide range of hardware and software skills, including MS Office and various content management systems. I also know (and love) the Chicago Manual of Style and the Associated Press Stylebook. Basically, I'm here to help you communicate your message to the right audience effectively and efficiently, on time and on budget. Developing and implementing integrated communications strategies; building and refining brand voices. Leveraging existing content and creating new content to meet institutional objectives. Strategically developing digital content for search engine optimization. Creating and publishing content on time and on budget. Optimizing content for diverse audiences (mobile/local/international). Consulting on social media best practices. Coordinating and managing multimedia projects. Collaborating, managing and mentoring internal team members. Acting as liaison with internal and external teams and media outlets.